Seeing is Believing This sample manual to teach Project Planning: All You Need to Know is in MS Word format. This is a one-day course which gives students a grasp of how to plan those small- to medium-sized projects that don't require oversight by a certified project manager. You know the type, the little jobs that need to be done often around the office but aren't big enough to put the full project management machinery into action. 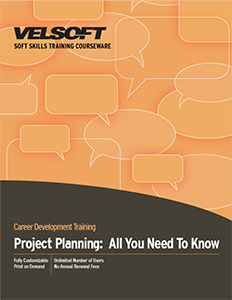 Students will learn about the basics of project management and then move onto a look at how to begin project planning before moving along for a discussion of the Work Breakdown Structure. The course then proceeds to a look at how to prepare a basic schedule, the Resource Breakdown Structure and wraps up with consideration of the project planning worksheet. Download your free sample today for a sneak peek at this course.